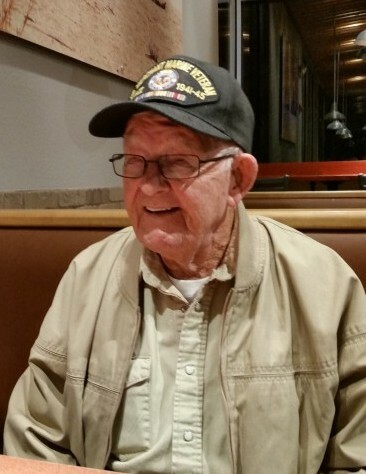 Clarence Albert McDonald, 91, of McKinney, TX, formerly of Arthur, died Wednesday, July 11th in McKinney, TX. Clarence was born on July 14, 1926 in North Platte to John and Gertrude (Ward) McDonald. He received his early education in Arthur and graduated from Arthur High School in 1944. Clarence entered the US Merchant Marines in January 1945 and was honorably discharged in May 18, 1954. After being discharged Clarence was employed as a truck driver for thirty years. On December 20, 1952 Clarence married Marjorie Fogland in Yuma, AZ. The couple made their home in Norwalk CA. until 1982 when they moved to Lawton, OK. In 1993 they retired and moved to Arthur. Clarence was baptized and became a member of the Arthur Baptist Church. He was also a member of the American Legion Post 207. Clarence thoroughly enjoyed his retirement years in Arthur. He liked to fish and attend the local ballgames and the Arthur fair and rodeo. He spent his past time reading, watching college football games, especially the Nebraska CornHuskers, and baseball games. Clarence loved spending time with his family and friends. In later year, his dog Tina was his faithful companion. Clarence had a good sense of humor and will be remembered as a great Dad, Grandpa, Uncle and Friend. He will be deeply missed by his family and friends. He is preceded in death by his wife Majorie, his son Donald Cooney, daughter Latissua and husband Max Farris, three brothers Gene, Ray and Clyde McDonald and son-in-law Arthur Styer. Survivors include his son John (Kris) McDonald of Mckinney, TX; Daughters Rosemary Styer of Linda Vista, Ca., Canda(Emil) Licka of St. George, UT, Barbara (Brandon) Smith of Hisperia, CA, daughter-in- law Barbara Sue Cooney of Kendrick, OK, sister-in-law Hazel McDonald of Arthur; 10 grandchildren, 13 great grandchildren, 9 great-great grandchildren and several nieces and nephews. The family has chosen cremation. A memorial service will be on Saturday July 21, 2018 at 2:00 p.m. in the Arthur Baptist Church with Rev. Blake Wilkes officiating. Memorials can be made in Clarence's memory to the Arthur Baptist Church. Inurnment will be in the Arthur Cemetery with Military rites by the Arthur Legion Post #207. Condolences can be sent by signing the guest book. The service will be live streamed. Draucker Funeral Home is entrusted with the arrangements.